Our aluminum wall vents can also be used on the ceiling and are installed by simply screwing the faceplate into place. These Victorian register covers have a steel damper backing which opens and closes to allow for airflow control. Choose your aluminum wall vents to come either in a bare or painted white, brown or black finish. If the Victorian register covers are left bare, they will be finished in a clear coat for protection. Each of the aluminum wall vents are handmade with a 1/4" thick faceplate to give it an old world feel. Also, the Victorian register covers are molded with a sand cast here in America to ensure reliable craftsmanship. The aluminum wall vents will not rust and are great to use in locations with higher levels of moisture, such as the bathroom. Order the Victorian register covers with or without pre drilled screw holes and have it all shipped right to your door. Tip: To order aluminum wall vents, measure actual duct opening. Do not measure your old vent. A hole opening of 8 x 8 inches will require an 8 x 8 vent. Faceplates of the Victorian register covers will have an additional 2 inches added to the listed size. Actual measurements can vary since they are sand cast by hand. Important: The aluminum wall vents are made to order and have a lead time of 7 to 9 weeks after payment has been received. These Victorian register covers are considered special order and are non returnable items which cannot be canceled once an order has been placed. 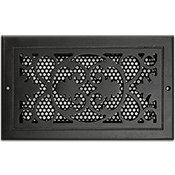 Find other aluminum wall vents made by Classic Grilles on our website and select the style that best suits your home. These Victorian register covers are also available as a return air grille which has a screen backing. Install these aluminum wall vents in your home and replace old and rusted metal registers. Click or call us to place an order today!